When asked what inspired me to start uConnect, I usually tell a story about an underutilized career center. While I was an undergrad at UMass Amherst, I frequently visited the career center. So after graduation, when tasked with hiring junior analysts for the private equity firm where I was working, my first instinct was to call the Director of Career Services at my alma mater to coordinate an info session. Eager to meet enthusiastic, hungry UMass students, I got in my car and drove two hours out to Western Mass sure I would return to my employer with a list of candidates aching to join our team. When I arrived on campus I was greeted by less than a dozen students out of the 20,000 on campus. After the event, I asked the Director why attendance was so low. She explained to me how hard it is for her office to reach students - very simply, she said "they communicate differently than they used to. Today, Students, are glued to their mobile phones, sending disappearing picture messages to one another, cruising the web, and definitely not paying attention to us." It had become too difficult to keep up with the advances in technology and communication savvy required to secure and retain their focus. Soon after I had a passion project. I offered some weekend time to help the career center at my alma mater improve their web presence and marketing strategy so that they could more effectively promote their services to students. It wasn’t long before I realized that student engagement with the career center is a big problem for a lot of schools. In fact, McKinsey and Co. recently found that 60% of the 2013 graduates they surveyed never stepped foot inside their career center while in college. It occured to me that the lack of engagement with career services, and career planning in general, was potenitally a overlooked source of the widely documented challeges students were having transitioning from college to career. Not long after I realized this was a large and growing problem for students and a threat to the future of higher education, I decided to leave the investment world, that I had sought after for so long, to launch uConnect. I was lucky enough to find my technical couterpart early and we set out with a goal to help colleges and universities raise awareness and engagement with career services, and improve their ability to impact meaningful career outcomes for students. 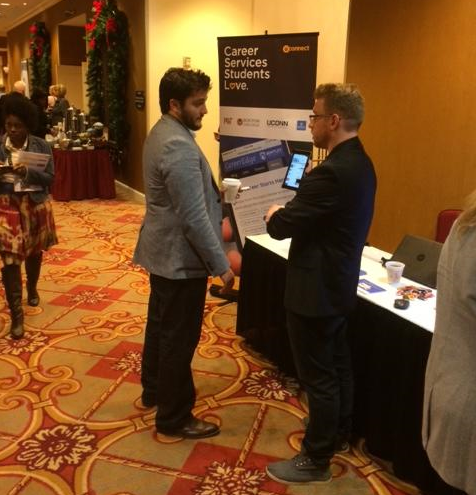 Some two plus years into building the business, we are part of the LearnLaunch Accelerator and I'm spending lots of time speaking with students, employers, and career service professionals. A lot of stories have motivated me to push our organizational mission forward but one example, in particular, hit close to home. Recently, a group of Babson College students visited our co-working space to learn more about start-ups and the growing education technology industry. At the event, they heard to first-hand accounts from young, ambitious entrepreneurs, like the group that started Testive, and even got a personal tour of our quirky office space. Babson is a small, prestigious, private business college with an amazing reputation for entrepreneurial studies. As an institution, they do a great job branding their school in a fresh, innovative way (check out Babson Connect and Babson San Francisco.) Nevertheless, despite a closely knit and career-oriented student body, even Babson struggles with with constant challenge of keeping students engaged in career programming. Brenda’s comment overwhelmed me; I felt a burst of energy and inspiration. Like Brenda, there are many great career service professionals all over U.S. campuses that work incredibly hard to help students plan and launch their careers. Too much of their work, and the potential value of said work, goes overlooked and underutilized. As soon as they left, I took the opportunity to share Brenda's comments with my team, further validating the immense opportunity we know we have to change how schools like Babson help bridge the gap between education and employment. My conversation with Brenda reminded me of why I started uConnect and now, why our growing team, works hard every day to push positive change. If more Babson students had come to the event, maybe more would have been motivated to work in the ed tech industry. Maybe some of them would have pursued their own entrepreneurial ventures. Maybe some of them would have worked with a startup to create cool in-classroom technology. For all of us at uConnect, maybe isn’t good enough. In short, we do what we do because students need and deserve more guidance and support exploring the wide range of potential career paths. We don’t want smart students getting lost in the chaos that is the job market; we want them to chart their own career paths and we want it to be fun. We started uConnect to help career centers facilitate this experience, making it easy for them to engage students in their offerings so that graduating students are prepared to navigate whatever path they choose. If you share this mission or have a similar story, I’d love to hear from you. Drop me a note at david@gouconnect.com or about how uConnect supports colleges and universities.